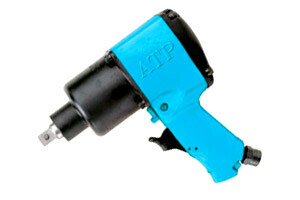 The 1/2" ATP-5040 Impact Wrench is ideally suited for the heavy duty maintenance and assembly applications. The "rocking dog" clutch is designed for either soft or hard pull-up conditions, with a super fast run down. The three piece housing provides access to all moving parts while the oil bath clutch provides for constant lubrication for added durability. Please feel free to contact us with any questions about the ATP 5040 impact wrench at 1-877-702-8665.